Official artwork of Knuckle Joe from Kirby Super Star Ultra. Knuckle Joe (ナックルジョー, Knuckle Joe) is an enemy from the Kirby universe. Knuckle Joe debuted as an enemy in Kirby Super Star (Kirby's Fun Pak in PAL regions): he is the source of the Fighter ability, as well as the Helper (an ally character who fights alongside Kirby throughout the levels) created with it. Knuckle Joe's attacks in Kirby Super Star usually consist of punches. He can do Vulcan Jabs (punching rapidly), a Smash Punch, and an uppercut. If Kirby copied the Knuckle Joe, he gets the same abilities as him, but the Smash Punch is much more powerful. Kirby is also now able to perform Rising Breaks, which involves jumping up and doing an uppercut to an enemy (sometimes both Kirby and Knuckle Joe in this case can also make use of throws). In Brawl, SSB4, and Ultimate Knuckle Joe appears as an assist trophy and performs Vulcan Jabs. His finishing attack can either be a Smash Punch or a Rising Break. In Kirby Super Star, Knuckle Joes are red with white hair, but when Kirby copies a Knuckle Joe and turns him into a Helper ally, the Knuckle Joe turns blue and has blond hair. The Knuckle Joe's design in Brawl, SSB4 and Ultimate is based on the Helper ally version of Knuckle Joe in Kirby Super Star. Knuckle Joe was mentioned in the Fighter Kirby trophy as "an enemy skilled at physical attacks". Knuckle Joe attacking in Brawl. In Super Smash Bros. Brawl, Knuckle Joe is one of the supporting characters that spawns from the Assist Trophy item. When Knuckle Joe is summoned, he uses his "Vulcan Jab" technique, which is a series of rapid punches, on the nearest foe. Afterwards, he finishes the opponent off with one of two "finisher" attacks: the strong, short-ranged "Smash Punch", or the electricity-charged uppercut known as the "Rising Break" technique. The finisher he uses is chosen at random. He will use the finisher either the second or third time he did the Vulcan Jab. He could be considered the most powerful Assist Trophy character, because if he manages to trap an opponent in his initial barrage, he can KO them at 0%. For this game, Knuckle Joe is peculiarly voiced by Alesia Glidewell, who also voiced Zero Suit Samus and Krystal. A martial artist known for amazing attacks like the Vulcan Jab. With his bandana, he looks and fights the part of a Muay Thai boxer. When Kirby copies Knuckle Joe, he gains the fighting techniques of a hand-to-hand-combat expert. Knuckle Joe also engages in friendly block-breaking competitions with Kirby. His other famous techniques are the Smash Punch and Rising Break. 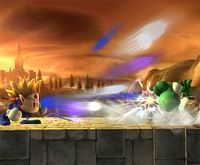 Knuckle Joe attacking in Super Smash Bros. for Wii U.
Knuckle Joe reprises his role as an Assist Trophy in Super Smash Bros. 4. He is functionally identical to his Brawl appearance, but the overall power of his Vulcan Jab and Rising Break have been considerably reduced, and neither attack can reliably OHKO opponents. As a trade-off, he now performs his attack pattern twice (a series of Vulcan Jabs then finishing with a Smash Punch/Rising Break) as opposed to once in Brawl, making him much more effective. He can also be defeated this time around. Knuckle Joe's trophy is one of the very few (along with Shadow the Hedgehog, Timmy & Tommy, Master Hand, and Crazy Hand) to be a Challenge unlock in both versions of SSB4. In Super Smash Bros. for Nintendo 3DS it is obtained by playing 10 collective hours (total gameplay x participants) of Smash. In Super Smash Bros. for Wii U it is obtained by clearing Classic Mode at intensity 9.0 without any customizations. A martial-arts master, Knuckle Joe can be inhaled by Kirby and his Fighter ability copied. If you summon him, he'll leap toward the enemy nearest you and unleash his powerful Vulcan Jab attack. He'll then finish off his target with a devastating Smash Punch or Rising Break. When Kirby copies this expert in all martial arts, he becomes a pro at hand-to-hand combat. Release Knuckle Joe in this game, and he'll jump towards the enemy nearest to you and unleash his mighty Vulcan Jab, then finish them off with a devastating Smash Punch or Rising Break! Knuckle Joe reprises his role as an Assist Trophy, seemingly unchanged from Super Smash Bros. For Wii U/3DS. Knuckle Joe now faces the screen regardless of direction he turns towards. Training Mode describes his Assist Trophy: Opens with a Vulcan Jab, and then unleashes Smash Punch or Rising Break. He also now has a spirit which is No. 379. He is an attack spirit. In his fight you fight a Ryu with stronger punches, kicks, knee strikes, and increased physical attack power. Knuckle Joe can also spawn as an assist trophy in the battle too. Knuckle Joe in Super Smash Bros. for Nintendo 3DS. 3DS challenge board unlock image. Wii U challenge board unlock image. Knuckle Joe, Gray Fox, Lyn and Shadow the Hedgehog are the only Assist Trophies in Brawl to say a complete phrase. In Brawl, his official artwork has his mouth wide open while his trophy has his mouth shut. Like Meta Knight, Knuckle Joe is also another Kirby character whose Japanese voice is a reprisal from the anime, as in his prior game appearances there were no voices for him provided. Both characters also have different English voices solely provided for their Smash appearances. Knuckle Joe is the only Assist Trophy in SSB4 who is a common enemy in his home universe that is not an enemy in Smash Run. This page was last edited on April 1, 2019, at 16:57.